Dendera (Arabic: دندرة‎ Dandarah; Coptic: ⲛⲓⲧⲉⲛⲧⲱⲣⲓ), also spelled Denderah, ancient Iunet, Tentyris or Tentyra is a small town and former bishopric in Egypt situated on the west bank of the Nile, about 5 kilometres (3 mi) south of Qena, on the opposite side of the river. It is located approximately 60 kilometres (37 mi) north of Luxor and remains a Latin Catholic titular see. It contains the Dendera Temple complex, one of the best-preserved temple sites from ancient Upper Egypt. At a rather isolated place at the edge of the desert, about 2.5 kilometres (1.6 mi) south-west of the modern town, lies what Dendera is famous for, a mostly Greco-Roman temple complex known in ancient Egyptian as Iunet or Tantere. The modern Arab town is built on the ancient site of Ta-ynt-netert, which means 'She of the Divine Pillar.' In the Greek era, the town was known as Tentyra. It was once the -modest- capital of the 6th Nome (Pharaonic province) of Upper Egypt, and was also called Nikentori or Nitentori, which means 'willow wood' or 'willow earth'. Some scholars[who?] believe the name derives from the sky and fertility goddess Hathor, also associated with the Greek Aphrodite, who was especially worshiped there. The official deity of the city was a crocodile. Crocodiles were also venerated as deities in other Egyptian cities, which gave rise to many quarrels, notably with Ombos. Serapion or Aprion, a contemporary and friend of the monk St. Pachomius, whose diocese boasted the celebrated convent of Tabennisi. The town was given its present Arabic name of Denderah during the late Ottoman Empire and ruled 6000 inhabitants in Qena (Qeneh) district. Jean-Rosière-Eugène Arnaud, Paris Foreign Missions Society (M.E.P.) (1958.03.02 – 1972.09.11). The Dendera Temple complex, which contains the Temple of Hathor, is one of the best-preserved temples, if not the best-preserved one, in all of Upper Egypt. The whole complex covers some 40,000 square meters and is surrounded by a hefty mud brick wall. The present building dates back to the times of the Ptolemaic dynasty and was completed by the Roman emperor Tiberius, but it rests on the foundations of earlier buildings dating back at least as far as Khufu (known as the Great Pyramid builder Cheops, the second Pharaoh of the 4th dynasty [c. 2613–c. 2494 BC]) but it was the pharao Pepi I Meryre who built the temple. It was once home to the celebrated Dendera zodiac, which is now displayed in the Louvre Museum in Paris. There are also Roman and pharaonic Mammisi (birth houses), ruins of a Coptic church and a small chapel dedicated to Isis, dating to the Roman or the Ptolemaic epoch. The area around the temple has been extensively landscaped and now has a modern visitor centre, bazaar and small cafeteria. This area has a large amount of sunshine year round due to its stable descending air and high pressure. According to the Köppen climate classification system, Dendera has a hot desert climate, abbreviated "BWh" on climate maps. ^ Philae-Data. "Iunet (Dendera)". ancientworlds.net. Archived from the original on 2008-05-17. ^ "Félix Teynard - Dendérah (Tentyris), Temple d'Athôr - Face Postérieure - Cléopatre et Cæsarion - The Metropolitan Museum of Art". metmuseum.org. ^ In old sources such as Belzoni. 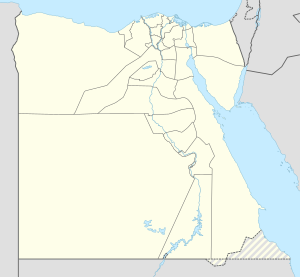 ^ "Dandara, Egypt Köpen Climate Classification (Weatherbase)". Weatherbase. Wikimedia Commons has media related to Dendera. Wikisource has the text of the 1911 Encyclopædia Britannica article Dendera. This article incorporates text from a publication now in the public domain: Herbermann, Charles, ed. (1913). "Tentyris" . Catholic Encyclopedia. New York: Robert Appleton. This page was last edited on 10 April 2019, at 15:53 (UTC).